KAO=S, between tradition & modernity! We just got a plenty conversation with this Japanese group who will debut on stage in Latin America for the Hanabi Matsuri at Sao Paulo on September, after his successful show at Tokyo International Music Market, his awesome featuring on CNN International, and his remembered American tour in Japan Nite 2012. Photos: Ric Quintanilla, Alex Morales y KAO=S for journalistic purposes. If I summarize my meeting with Kaori, Shuji, and Jack for that first time in one sentence, I would tell you that it was a plenty meeting friends. Period. Thus, I have known KAO=S on US Tour Japan Nite 2012 at Public Assembly, in the Williamsburg neighborhood now became in the hipster heart in Brooklyn. I remember that, despite the tiredness, they gave us this outgoing greeting to Latin America in the mood of their humble although the cold weather; they have talked about their music, their spotless live show and their passion promoting the traditional Japanese music mixed with modern sounds. At that time, they were so joyful overflowing their hearts due this abroad debut for the first time, but also they had several good reviews and positive answers received both at SXSW as his concert at Double Door in Chicago. Perhaps some of the memories that I will never forget was his reaction when we were introduce them as Latinos journalists covering this Japanese event, so we encourage them to be able to dream of performing in any stage in Latin America in the future. Now, that dream came true! 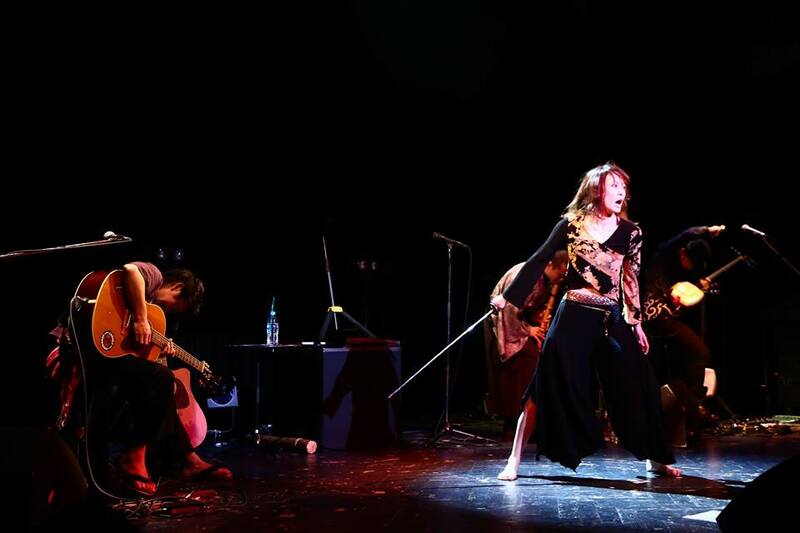 In April 2011, KAO=S was born in the Japanese musical surface as a very artistic proposal that focuses on the Japanese folk music mixed with live theatrical rock sounds. Its name comes from the English word “chaos” playing with the phonetic pronouncing way by the Japanese (/kah-oss/). Under the rock guitar and vocal by Yamagiri Shuji, the only one and cool style player shamisen Jack, and the dancing performance style along the sweetest voice of Kaori Kawabuchi, they have earned many followers in Japan and abroad as well; then, KAO=S got their choice playing for an international stage for the first time: SXSW 2012 along US Tour Japan Nite, where I met them. His show in Brooklyn was great so all the crowd have praise and thanked them for this joyful visit to learn us the beauty of the Japanese musical art, falling in love completely. Three years later, the musical path of KAO=S has been full of rewards. CNN International has invited them to participate for The Art of Movement TV series, giving them a meaningful importance to his music beyond borders. Likewise, they modeled for the artist Junk Law this summer. In addition, they are running his own crowdfunding via Indiegogo to produce and release his future new album since June 15th, and recently played as honor guests for the Tokyo International Music Market. But as I said before, one of those dreams is came true: on Saturday September 12th, KAO=S will play his music on live for the Hanabi Matsuri Festival in the cosmopolitan city of Sao Paulo, Brazil; yes, KAO=S achieved this goal and will react in a similar mood when we met that cold afternoon in March in the corner street of Williamsburg. Enjoy this nice interview! Colectivo Bunka. Thank you very much to attend us in this interview for Colombia and Latin America. 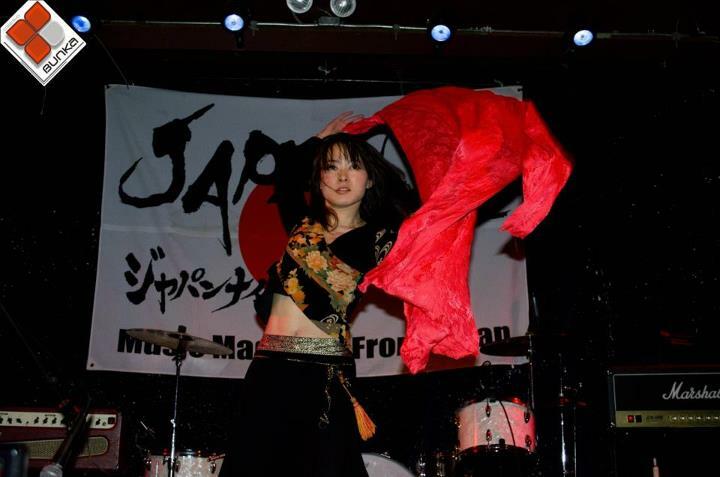 I remember our first meeting when KAO=S has played for US Tour Japan Nite 2012 in Brooklyn. It’s been a while! What memories do you keep about this first show in America with Audrey Kimura’s staff and other bands? Shuji. When we did a tour in the US in 2012, we performed live every day. Shows finished at midnight and we always had to move on to the next city early in the morning. Everyone needed to get more sleep and started getting stressed out, and then we had a big fight in San Francisco. It was a bonding experience. C. B. Personally, I am happy for your success and achievement such as SXSW 2012 & 2013, new release singles, new international showcases, a special feature for CNN International… What kind of things have positively changed inside KAO=S for that last years? Kaori. We had some great experiences performing overseas, and our confidence grew thanks to the reaction of the audiences. I thought that we really could be successful making the kind of music that we wanted to make, thanks to the response we got from our appearance on CNN and our overseas fans. Shuji. I strongly felt that more people became interested in KAO=S thanks to programs such as CNN International or the Tokyo International Music Market. It really encouraged us, and we felt that we were on the right path. It builds our creativity when KAO=S’s music reaches people beyond borders. C. B. Although we listen modern and new music tunes, why traditional Japanese music is catching all the overseas views yet in this present day? Jack. There’s a lot of great tradition music and folk music in the world. These genres don’t just mimic classical styles, they give scope for new discoveries. I think that people have started to notice this. 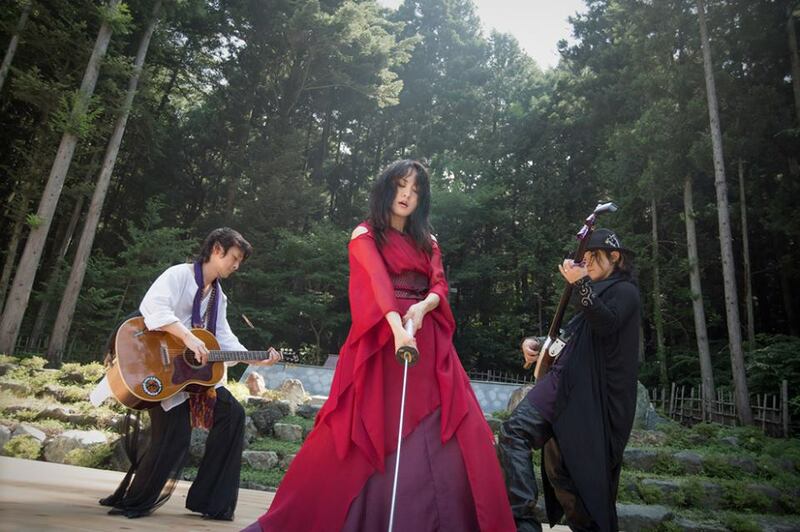 Above all, the Japanese Tsugaru Shamisen and Shakuhachi are easy to combine with Rock and Pop music, and I think that in this way more people will begin to become accustomed to them. 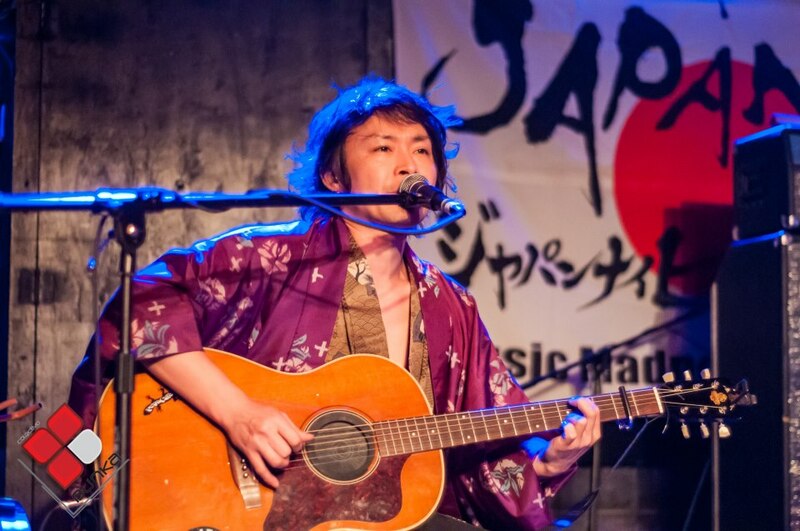 We will strive to join to group of musicians spreading new Japanese music throughout the world. C. B. Do you think that KAO=S is tagged as a World Music movement band by some media? How about your personal opinion about this special music category to describe traditional/folk music bands (such as African, Latin American, Gypsy, etc.)? Shuji. 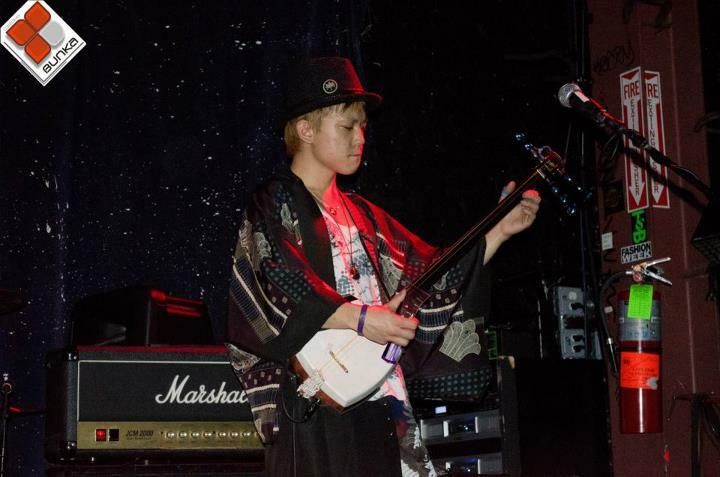 KAO=S has Japanese national elements, because we cover Japanese traditional music sometimes, and we have a Shamisen player. So I think that’s why we’re tagged as world music. But we think of KAO=S as a rock band. I really love rock bands which include the elements of folk music. I’ve been greatly influenced by Led Zeppelin. Led Zeppelin has many elements such as Celtic, Egyptian, Indian, and Irish in their music. So we’ve tried to include those elements in KAO=S’s music too. There are musical scales and styles unique to every country, and I think that people feel both nostalgia and a sense of something new in such primitive music. Jack. Many Shamisen players explain Shamisen as a “Japanese Banjo” overseas. I sort of regret that. If the Shamisen ever enters in to the global common language as “shamisen” like Indian sitars and banjos, I think that would be the best. It is one of my dreams. C. B. KAO=S started an overseas crowdfunding campaign to release their new album. Why you have decided this releasing campaign? What have been the reaction from your overseas and Japanese fans? Shuji. When KAO=S participated in the Tokyo International Music Market in 2014, people from around the world offered to host performances and sign contracts with KAO=S. However, they generally included the proviso that any deal would include the release of a new album. So, KAO=S had to come up with a new album soon, if we wanted to take advantage of these offers, and we ended up deciding to do crowd-funding. We were able to hit 135% of our crowd-funding target. We came up with various perks for contributors to our Japanese crowd funding campaign on “Motion Gallery,” and it was popular with a lot of Japanese people. On the other hand, this was the first time that we did crowd funding abroad. It was very different from Japan; we were only able to come up with digital-only perks, but a lot of people supported KAO=S, for which we were very grateful. Shuji. Samba and Bossa Nova are known well in Japan, and there are many fans, too. As for bands from Latin America, I know Brazilian Metal Band “Sepultura”. I have listened to their album “CHAOS A.D.” many times. Jack. When I was in my early twenties, I used to listen Bossa Nova a lot. I like João Gilberto, Caetano Veloso and Nara Lofego Leão. For Tango and other Latin music, I have played songs like Libertango, Spain, Morend Cafe, La Bamba and Volare with a Shamisen. And I played these alongside a Spanish guitarist, before. If I get a chance to play with a local musician in Brazil, that would be great. Kaori. It may not be music from Latin America, but I love the passionate music and dance of Flamenco. I couldn’t forget it after watching the live performance of Flamenco. I have been to Flamenco classes. It was very difficult. Especially the movement of hands and feet. But I want to try it again! C. B. What are your expectations about this Brazilian showcase for Hanabi Matsuri (Sao Paulo) on September 12th? Shuji. I would be so glad and happy if Brazilians at the festival enjoy our performance. Jack. It would be fantastic if, one day, Brazilians sing along to one of KAO=S’s songs with us. It might be a bit difficult to expect that this time, but I’ll do my best with my Shamisen so that next time, they might! C. B. What Asian artists and/or bands currently we can recommend? Shuji. These are all very popular, but ONE OK ROCK, X JAPAN, LUNA SEA, and L’Arc-en-Ciel are cool. Of course I recommend KAO=S, too. Kaori. I recommend the sound track composers Kitarō, Yoko Kanno, Tetsuya Takahashi and Keiichi Okabe. C. B. What plans do you have this year and 2016 after Hanabi Matsuri? Shuji. We will release the new album at the end of October, and we are planning our US tour next spring. Shuji. Thank you for being interested in Japanese music. We will release the new album this autumn and will keep releasing in the future. Please look forward to it and enjoy our music. Jack. Thank you for reading our interview. KAO=S’s biggest talent is live performance. We hope to see you when we play in your country. Kaori. Please look forward to KAO=S’s new album, and our live show in Brazil. We’ll try and play some KAO=S-style deep rock music for you. Thank you for supporting us always and keep in touch with KAO=S!! Shuji. We met Colectivo Bunka during our 2012 tour in the U.S. I’m very thankful that relationship still continues on, and please keep supporting KAO=S. I hope you’re looking forward to KAO=S, because we will rock you!! Jack. Thank you for supporting KAO=S always. It’s been 3 years since we met in US. We won’t disappoint in Brazil. Colectivo Bunka SAIKOU!! Kaori. I’ve never forgotten our interview on that New York street corner during the Japan Nite Tour in 2012. Thank you so much for that interview and this one. Please spread the word about KAO=S, because we’re going to make coolest music! KAO=S’s special greeting to Latin America in NYC Japan Nite 2012.